Francesco Franciotti first appears at Painesville, Lake County, Ohio, in 1926. In America, Francesco Franciotti was known Frank Franciottii. Mr. Franciotti, and his wife, lived on Sanford Street, Painesville, from the late 1920’s until his death, in 1959. Francesco Franciotti, son of Angelo Franciotti and Rosa Pantoloni, was born on February 27, 1896, at Folignano, Ascoli Province, Marche, Italy. Francesco married Filipina Ingavo, daughter of Nunzio Ingavo and Cristina DiFore, on April 2, 1926, at Mt. Carmel Catholic Church, Ashtabula, Ashtabula County, Ohio. Filipina Ingavo was born on September 11, 1906, at Ashtabula, Ohio. 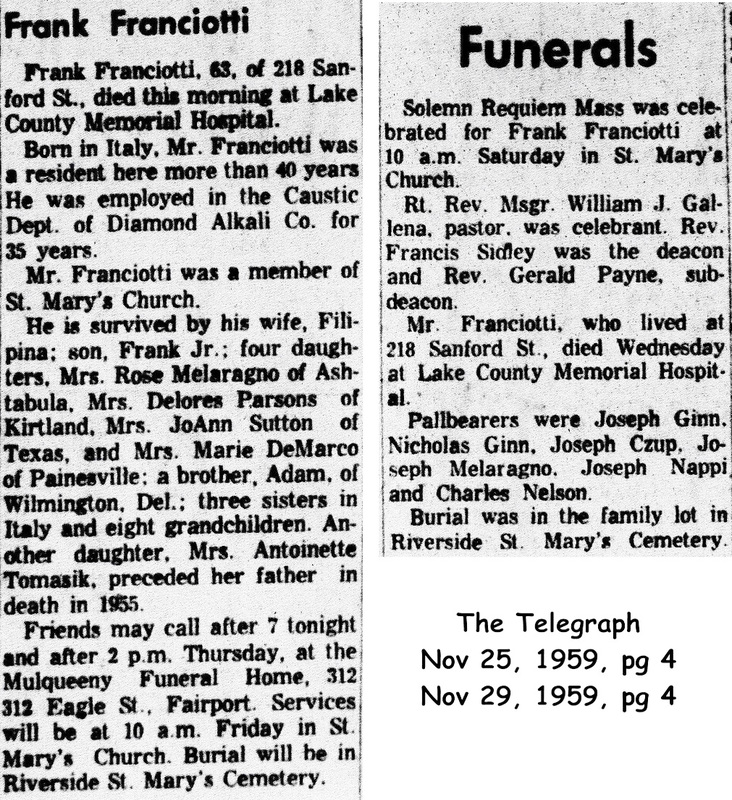 Francesco Franciotti died on November 25, 1959, at Lake County Memorial Hospital, Painesville, Lake County, Ohio, at age 63. His body was interred at Riverside Cemetery, Painesville, Lake County, Ohio. Francesco Franciotti emigrated from port of Naples, Napoli Province, Campania, Italy, on March 3, 1913, aboard the ship S.S. Ancona. Francesco, age 17, first immigrated to the United States on March 13, 1913, at port of Philadelphia, Philadelphia County, Pennsylvania. Francesco Franciotti’s final destination was 116 Washington Street, Youngstown, Mahoning County, Ohio. Francesco registered for the military draft for World War One on June 5, 1917. He was living at 331 Himrod Street, Youngstown, Mahoning County, Ohio. He was employed by the Trussed Concrete Steel Company. Francesco’s name on the record was Franciotti Francesco. Francesco Franciotti was enumerated for the 1930 Census of the United States, on May 8, 1930, living at 208 Sanford Street, Painesville City – Ward Four, Lake County, Ohio, as a head of household. Francesco Franciotti became a citizen of the United States in 1933. Francesco resided at 218 Sanford Street, Painesville, Lake County, Ohio when he was naturalized. Angelo Guerra and Martin Valocchi were witnesses for Mr. Franciotti at his naturalization hearing. 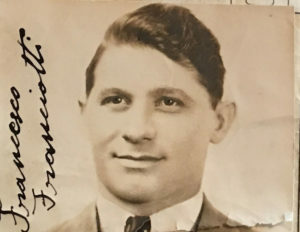 Francesco Fanicotti was a witness for Vitale Valocchi at his Citizenship hearing at the Lake County, Ohio, Common Pleas Court on September 21, 1936. Francesco Franciotti was enumerated for the 1940 Census of the United States, on April 9, 1940, living at 218 Sanford Street, Painesville, Lake County, Ohio, as a head of household. Mr. Franciotti was employed by the Diamond Alkali Company for 35 years. At the time of death, Francesco resided at 218 Sanford Street, Painesville, Lake County, Ohio. 1. Rose Franciotti was born about 1927, at Ohio. 2 . Antionette Franciotti was born in 1928, at Ohio. Antionette married Louis Tomasik Jr. Antionette Franciotti died in 1955. 3. Frank A. Franciotti Jr. was born on July 4, 1930, at Ohio. Frank married Julane Jolly Davisson, daughter of Brooks Davisson and Julia Jolly, on November 14, 1953, at Lake County, Ohio. Frank A. Franciotti Jr. died on February 8, 2016, at Houston, Harris County, Texas, at age 85. His body was interred at Riverside Cemetery, Painesville, Lake County, Ohio. 4. Deloris Christine Franciotti was born on October 5, 1931, at Ohio. Deloris married William Earl Parsons, son of William B. Parsons and Elvia Leist, on August 26, 1950, at Lake County, Ohio. 5. Joann Marie Franciotti was born on February 17, 1934, at Ohio. Joann married Joseph Luke Hogya, son of Frank Hogya and Esther Simko, on October 10, 1953, at Lake County, Ohio. 6. Marie Franciotti was born on April 5, 1936, at Painesville, Lake County, Ohio. Marie married Louis F. DeMarco, son of Francesco DeMarco and Mabel Thomas. Marie Franciotti died on June 21, 1990, at Humana Hospital, Webster, Texas, at age 54. Her body was interred at Richmond, Virginia.